In September 2017, Charanga’s VIP Studio Sessions, the online music education platform that teaches young people how to write, produce and record their own tracks and songs, has further improved the way teachers can listen to, mark and assess students’ work on the site. When VIP was first developed, one main feature was the fact that students could save their work online, all in one place. This removed the need for teachers to spend lesson time going from computer to computer saving each student’s work to a memory stick, struggling to save to a school network, or other workarounds for the issue. VIP’s solution to this problem was its unique development of a complete education platform with an online studio, tutorials on how to write music in different genres, and the ability to save work online in one place where the teachers can access and review their activity. 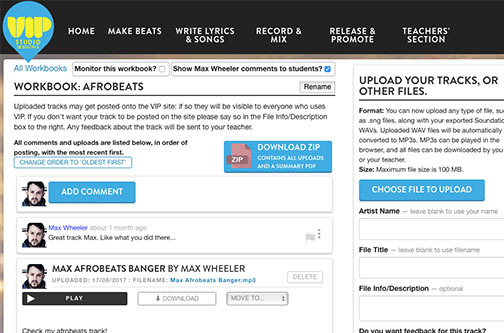 On teachers’ requests, we have now added a new ‘Workbook’ feature allowing students to upload multiple pieces of music, screengrabs and videos to a portfolio-style ‘Workbook’, which can then be commented on by teachers and downloaded easily as a single zip file for evidence and assessment. To see how VIP could work in your school or setting, please email melindarobson@charanga.com or start a 30-day free trial.